Farmhouse clocks are stunning focal pieces and can complement virtually any interior design, but they’re even more special when they’re handmade. If you’d like to test your skills at the DIY décor trend, there’s no better place to start than at Paintbrushes and Party. Located in Poughkeepsie, NY, their paint and sip art studio is the perfect place to get together with friends and loved ones to create a beautiful keepsake. Here, their creative team shares some information about their newest addition to their DIY Projects Designs lineup: farmhouse clocks. For starters, you and your fellow painters will select the clock size and style of your choice. Clocks are available in 12-inch, 18-inch, 24-inch, and 36-inch diameters, and you can also choose among ridged or non-ridged faces. Keep in mind, the first 10 guests to sign up for a clock painting event and select the 36-inch size will receive 50% off a future Canvas Painting Class! Additionally, the clock hands come in either black or white to match with your unique design. After you’ve selected your clock type, the real fun begins. Your options are virtually endless, but with the help of an instructor and plenty of inspirational clocks to look at, you’ll design the perfect piece to give as a gift—or keep for yourself! Some painters like to include meaningful quotes, the family’s last name, or fun sayings like “It’s five o’clock somewhere” to personalize their artwork. 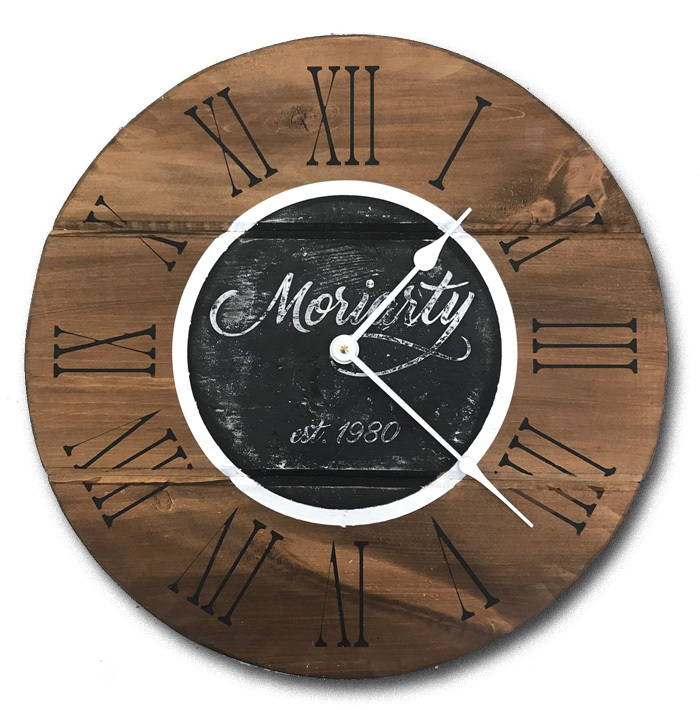 Others prefer a simpler aesthetic and use regal Roman numerals, compass designs, or a country chic flair to decorate their farmhouse clocks. No matter your chosen design, farmhouse clocks make the perfect gift for housewarming, weddings, new babies, and anniversaries. But they’re also a great present to give for no occasion at all! After you’ve completed your project, you might find it difficult to part ways with your masterpiece, so feel free to come back and paint another one for yourself or a different recipient! To attend, you and your fellow painters can check the calendar on Paintbrushes and Party’s website. There, you can see which dates and times are designated to the clock project. Simply call to reserve the spot for your guests—but act quickly, because classes fill up fast! Of course, if you have a special occasion like a bachelorette party, work function, or a special girls’ night out you’d like to celebrate, you can always inquire about scheduling a private party for painting farmhouse clocks by calling (845) 467-2468. Don’t forget to visit Paintbrushes and Party on Facebook for more of the latest updates.